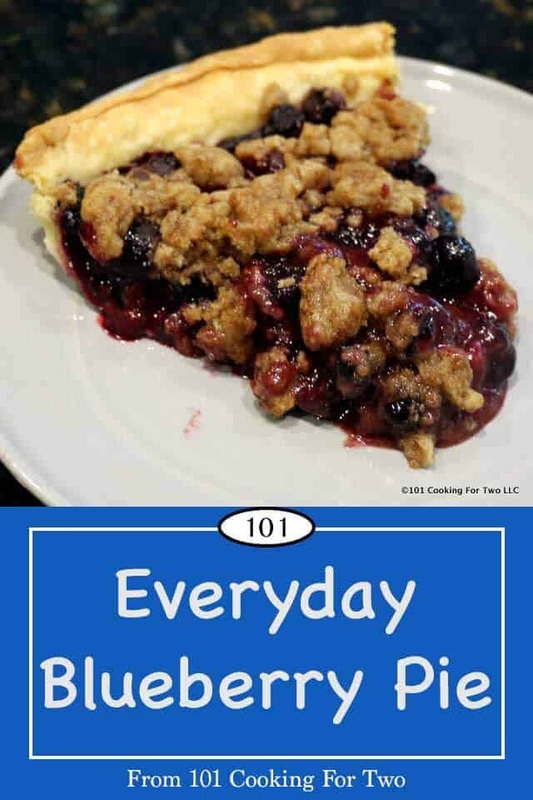 This simple blueberry crumb pie will move pie from an occasional treat to an everyday family dessert. 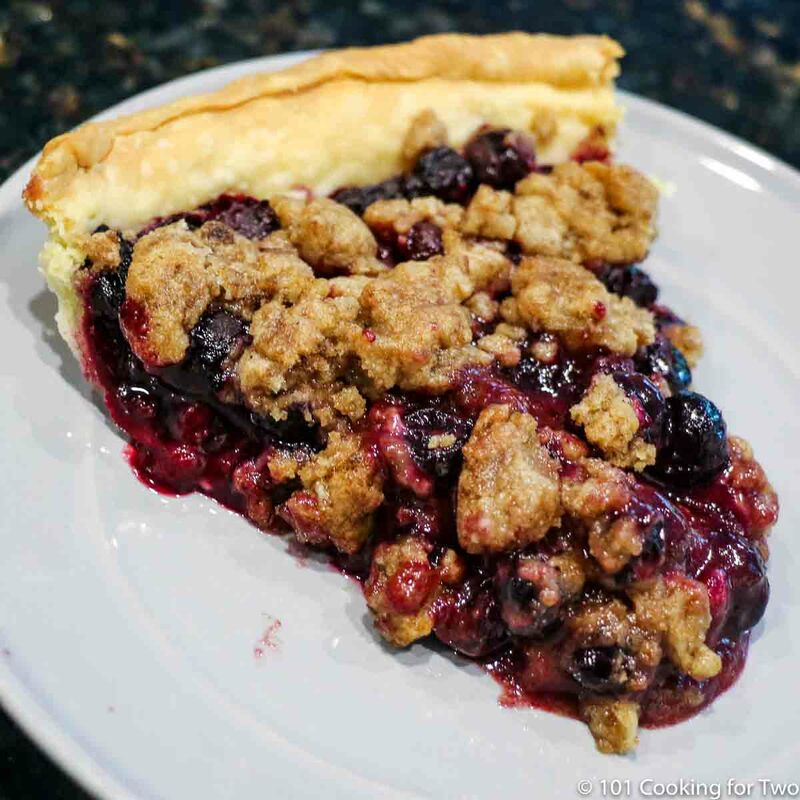 The crispy crumble topping combines with the sweet and juicy berry pie filling for a great treat. 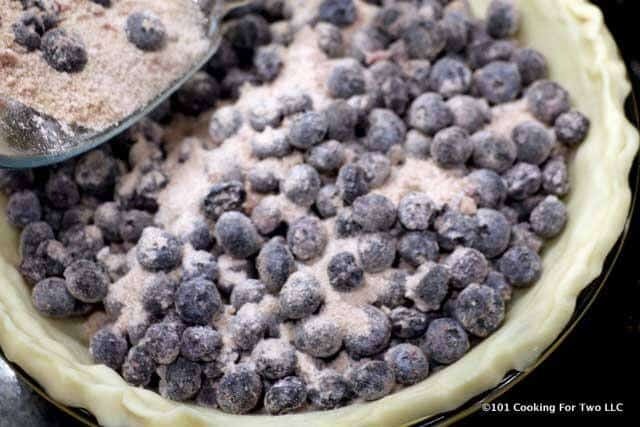 It is the start of blueberry season here in Michigan and that calls for a blueberry recipe. 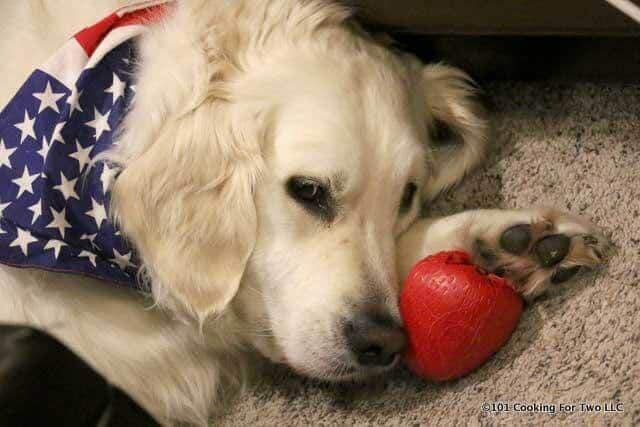 Many states produce blueberries and I suspect theirs are fine, I will just say “shop local”. OK, no snarky comments on this, please. We all want the absolute best desserts, and a pie should obviously be out this world. Now let’s get back to reality. Really good and tasty is the goal for us everyday cooks. We want really good results with not too much work. A good reward to effort ratio so to speak. First, how many of us will routinely make a pie crust? Yes, I have, but effort takes it out of the “everyday” range. So it is either no pie or cheating a little. You can buy a pie, not the disgusting supermarket ones but from a real bakery. Or you can cheat. I choose to cheat. To me, the hardest part of pie making is making the crust. You know, mixing, cutting in the butter/shortening then cooling and finally rolling it out. I’m sweating just thinking about it. A distant second is cutting the butter into the topping. Well, I buy a crust and semi-melt the butter. Works of me and will move pie from a very special treat to everyday cooking. A nice solid 4. A very nice slice of pie. Frozen berries are fine here. If you are using them, a tablespoon more of flour for thickening may be a good idea since they release more liquid. Also, cooking about 10 minutes longer will help. Preheat oven to 375. Place a baking sheet on the bottom rack for any pie spillage. 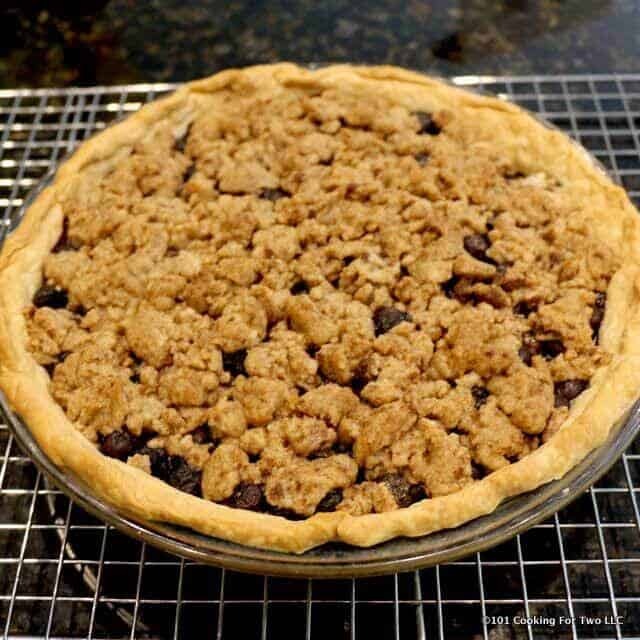 Spread a refrigerator pie crust into a 9-inch pie crust and crimp edge. Prepare topping. Microwave 1 stick (1/2 cup) salted butter for 15-20 seconds until partly melted. Add 1 cup flour, 1/2 cup brown sugar, and 1/2 teaspoon cinnamon. Mix well until crumbly. 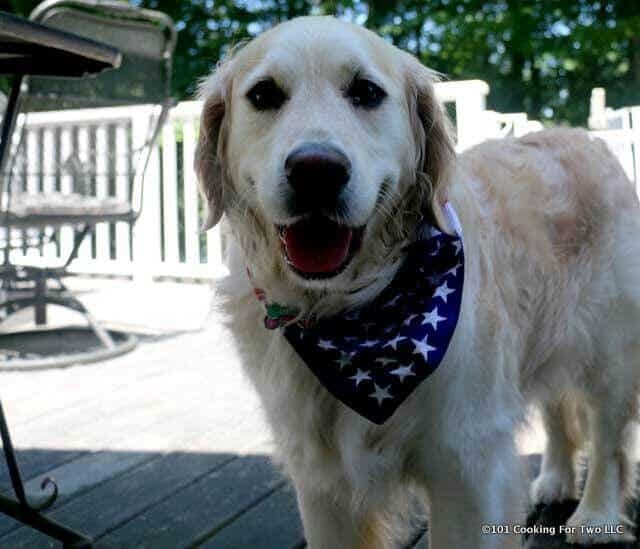 Combine 4 cups blueberries (frozen or fresh) with 1/2 cup sugar, 3 tablespoons flour, and 1 teaspoon cinnamon. Stir to coat berries well. If your berries are frozen, add an extra tablespoon of flour to compensate for the extra fluid release. 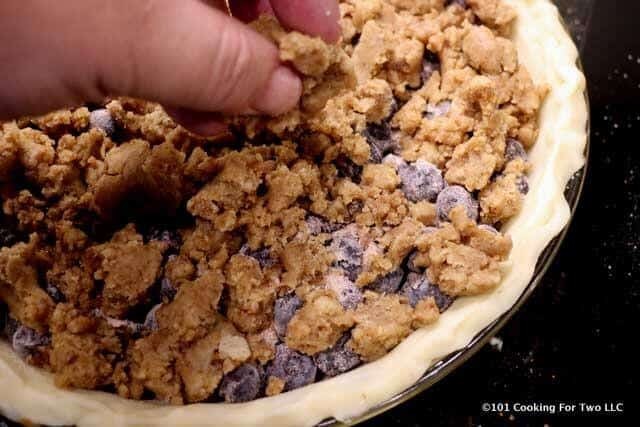 Add the blueberries to the prepared crust. If there is sugar mixture that did not stick to the blueberries, then spread that over the top of the berries. 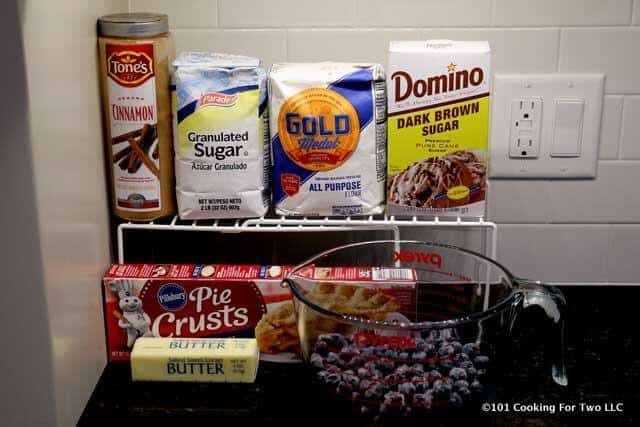 Add the crumb topping. Place on middle rack in preheated oven. About 20 minutes into the baking, you should protect the edge of the crust with foil or one of those fancy pie rings. Bake for 40-50 minutes until nicely brown. About 10 minutes longer if berries are frozen. Cool completely before serving. At least 2 hours. 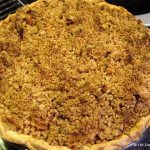 Spread a refrigerator pie crust into a 9-inch pie crust and crimp edge. Prepare topping. Microwave 1 stick (1/2 cup) salted butter for 15-20 seconds until partly melted. Add 1 cup flour, 1/2 cup brown sugar, and 1/2 teaspoon cinnamon. 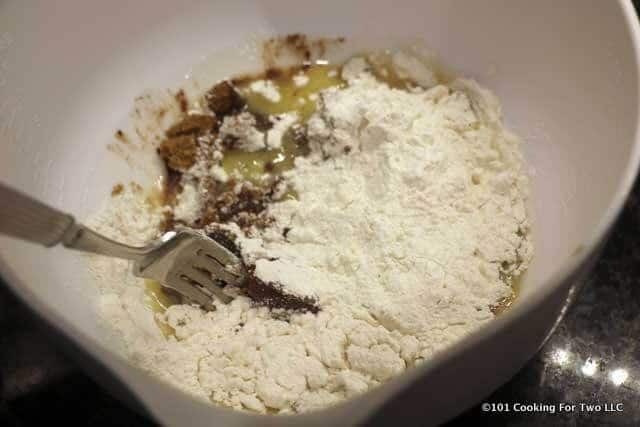 Mix well until crumbly. 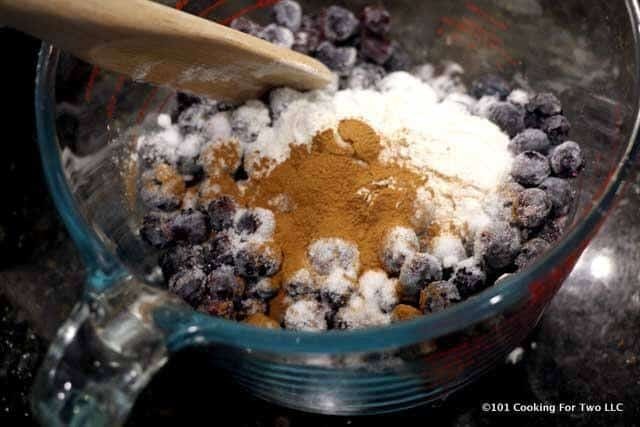 Combine 4 cups blueberries (frozen or fresh) with 1/2 cup sugar, 3 tablespoons flour, and 1 teaspoon cinnamon. Stir to coat berries well. Place on middle rack in preheated oven. About 20 minutes into the baking, you should protect the edge of the crust with foil or one of those fancy pie rings. Bake for 40-50 minutes until nicely brown. If using frozen berries, add about 10 minutes. Frozen berries are fine here. If you are using frozen berries, a tablespoon more of flour for thickening may be a good idea since they release more liquid. Also, bake about 10 minutes longer.